What is Pilates for Living? Pilates is for everyone, whatever your age or fitness. 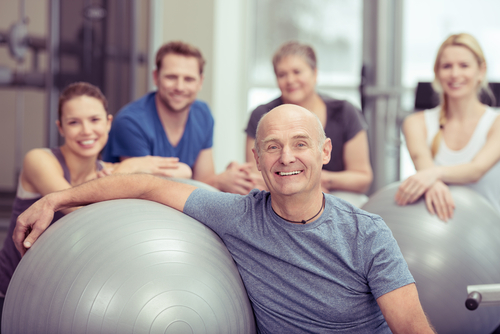 Pilates for Living is modified Pilates taught in Earlsdon, Coventry by Chartered Physiotherapists. It exercises the whole body through mat and small equipment based exercises, rebalancing muscles. The classes build the body's core strength and improve flexibility, tone and posture through a series of gentle low impact stretching and conditioning exercises. Attending a Pilates class led by a Chartered Physiotherapist gives you the confidence that you are in safe hands. Physiotherapists provide treatment for a wide range of medical conditions together with rehabilitation following injury or surgery. Whilst the classes are designed for a group setting, your instructor will be able to show you how exercises can be adapted to suit you and how to vary the level of challenge or difficulty. Pilates can help with a number of common complaints including back and neck pain, joint problems, or stiffness. It can be used by athletes to 'cross train', complementing sport specific training and reducing injury risk. Antenatal and Postnatal ladies: Pilates is a safe and excellent form of exercise for ladies during or after pregnancy allowing you to maintain body strength, flexibility and posture as your body changes. Classes run every Thursday during term time, at 9:45am & 10:45am. They run in 6 or 7 week blocks but you can start at any time with a taster session. Each class costs £8. Need a different time?... Register your interest through our contact page and we will be in touch as we create new classes. Classes run at Earlsdon Methodist Church Community Hall, Albany Road, Coventry CV5 6NF. The Community Hall is upstairs in the building next to the church. Parking is available around the church hall or in nearby roads (check road signs for any restrictions). Call, email our use our contact page below to receive your Registration Form and book your place. You will need to bring your own exercise mat. All other equipment will be provided. Classes are run by Chartered Physiotherapist Katie Davis. Katie graduated from Birmingham University in 1999 and has been working since in both the NHS and private practice. She undertook her postgraduate training in Pilates with the APPI (The Australian Physiotherapy & Pilates Institute) and has taught Pilates classes across The Midlands. As a Physiotherapist she specialises in Musculoskeletal conditions so whether you have back ache, neck ache, joint injury, recovering from a sports injury or just want to safely improve your general core strength, balance and flexibility she can advise you on exercises to suit you. Katie has a special interest in Women's Health, treating antenatal and postnatal ladies and issues of urinary incontinence or pelvic organ prolapse. 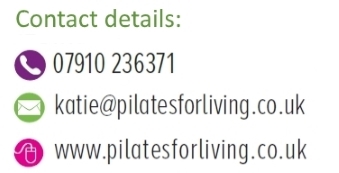 If you would like to arrange a 1:1 Pilates or Physiotherapy appointment with Katie this can be booked at our partner clinic - Pilgrims Physiotherapy.